Bellevue Avenue real estate in Newport, RI, home to some of the most spectacular mansions on earth, is the product of an unprecedented social race to the top which began in 1880 and ended in 1913. Prior to 1913 there were no federal income taxes, and railroad barons, steel magnates and other titans of the Industrial Age amassed such vast fortunes that there was virtually no limit to what they could spend on their Newport summer "cottages." Bellevue Avenue itself extends from downtown Newport to Bailey's Beach on the southeastern end of the island. Bellevue Avenue real estate includes of a few Gilded Age mansions which have been converted into fabulous condominiums. A few Bellevue Avenue mansions still remain in private hands and are available for sale. Scroll down to view Bellevue Avenue homes for sale, or read more about Bellevue Avenue real estate. 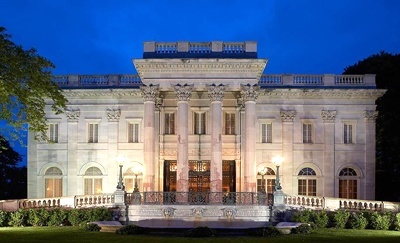 Today, The Newport Preservation Society owns and operates many of the Bellevue Avenue luxury homes and larger mansions including William Vanderbilt's Marble House pictured near the top of the page. These mansions, including Bellevue Avenue mansions, are open to the public and provide a glimpse into the lives of the families who shaped Newport's Gilded Age. Residents living in the area can take advantage of Newport's majestic Cliff Walk, a 3.5-mile public access walkway which winds along and around the shoreline through southeast Newport. It runs from the east part of Bailey's Beach to First Beach. Take the walk and you'll view many of Newport's gilded mansions in all their grandeur. Astor's Beechwood, Rosecliff, The Breakers, Marble House, Ochre Court and Rough Point are the highlights. The walk is paved and offers beautiful views, however the last half has some unpaved sections, which can be challenging, however the challenge is rewarded with stunning views. If you enjoy golfing in your spare time, Bellevue Avenue condos are not far from the historic Newport Country Club, which is a private club that hosted the first ever US Open in 1895. Also nearby is Brenton State Park and Fort Adams State Park. Situated at the mouth of the Newport harbor, Fort Adams hosts the annual Newport Jazz festival, a three-day jazz celebration that is a must-see for any jazz fans. For a tour of Newport homes, condos, or mansions for sale on Bellevue Avenue, contact us online or call (401) 845-9500 to speak with a Hogan Associates REALTOR® familiar with the neighborhoods of Newport.